My daughters Eleanore and Genevieve dressed as the fairies Summer and Fall. As some of you may or may not know, my wife Mary is a theatrical costumer and costume hobbyist (although "fanatic" might be a more appropriate term), and she enjoyed sewing costumes for our four children. In this picture, my two youngest daughters are dressed as the fairies from The Warlock Is Missing, Eleanore as Summer and Genevieve as Fall... but there's an interesting story behind that. It's actually the other way around. The Summer Fairy and Fall Fairy costumes stared life as Halloween costumes my wife made for my daughters (actually, the Fall Fairy was originally a Robin Hood costume for my son, but that's a different story). During the 1980s, I attended several SFF conventions a year, often dragging my wife and children with me. One of the things my children enjoyed, however, was getting to dress up in hall costumes at conventions—it was like having Halloween several times a year! 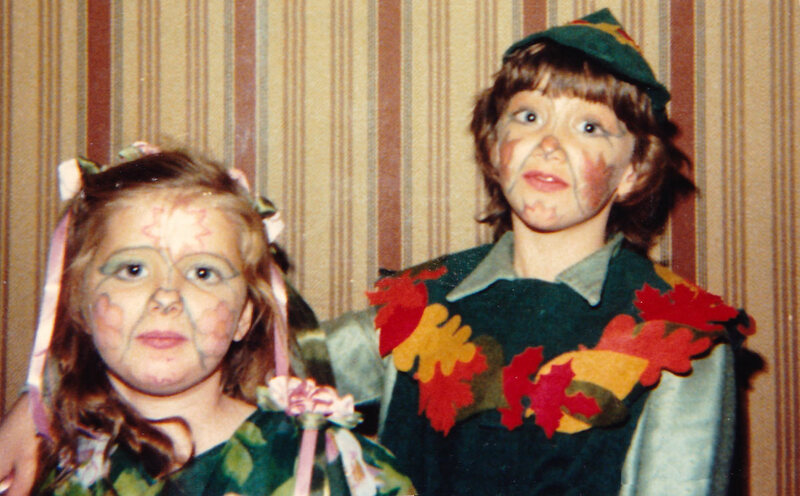 In 1983, my family and I attended Lastcon 3 (or Lastcon T'ree, as they called it) in Albany, New York, and my two youngest daughters roamed the halls in their fairy costumes. A fellow costume hobbyist, admiring the fairy costumes, suggested to my wife that they should enter the Masquerade costume competition. Well, Mary had never entered a Masquerade before and was excited to get the invitation, so she registered for it. Then, just before the Masquerade began, with my daughters already in costume and makeup, Mary was shocked to discover that this was a Recreation Masquerade—in other words, all costumes had to be recreations of outfits in SFF movies, television, comics, or books. The two fairy costumes, however, were not, so they were on the verge of being disqualified. With my daughters confused and my wife near tears, I proposed a solution: I offered to write these two fairies into my next book. Thankfully, the Masquerade officials were lenient and allowed it. So you see, it wasn't so much that my daughters were dressed as the fairy characters Summer and Fall from The Warlock Is Missing. Rather, the characters in the novel were based on them. In fact, I incorporated their physical appearance and personalities into the fairy characters, and even threw in a little undertone of sibling rivalry. Hey, it was fun! And the outcome of the Masquerade? My wife won her first prize, the award for Cutest Fairies (a category I'm fairly sure the judges made up just for my daughters), and shortly after that this photo was taken. But what, you may ask, brings this old story to mind over thirty years later? Well, it ends where it began: on Halloween. My daughter Genevieve is a grown woman now with three children of her own. Somehow, for some reason, she kept her Fall Fairy costume all these years. And this last Halloween, in 2015, Genevieve texted me this photo of my granddaughter Grace in her Halloween costume. 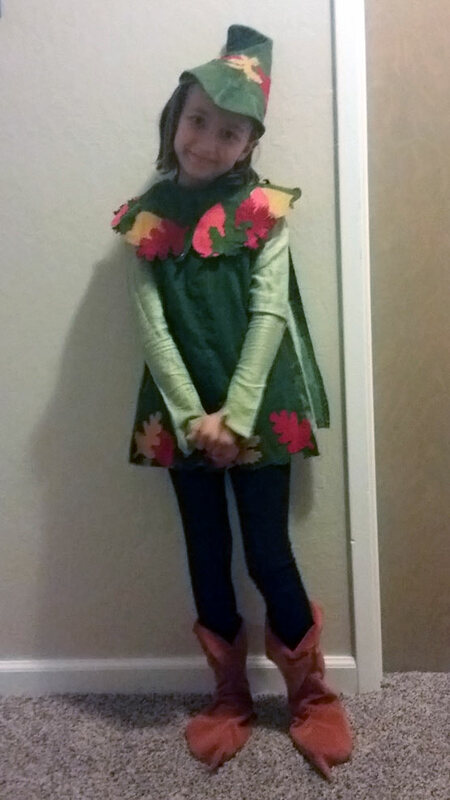 Grace, after seeing the photo of her mom dressed as the Fall Fairy, then finding that her mother she still had the costume, and discovering to her delight that it fit her, Grace decided to dress as the Fall Fairy for Halloween. Well, technically, she had three different costumes for Halloween, and wore a different one to each event. My wife would approve. Clearly, Grace has inherited some of Mary's genes. So things have come full circle, and the costume has become a family heirloom. I doubt I'll live to see it passed on to the third generation... but I can share the story with you.